Of the many signs that point to the growing influence among Turks and Kurds living in Germany of the Justice and Development Party [AKP], which represents an "updated" Islamist ideology, the worst aspect of it is that it will likely go unopposed. The June 2011 election victory in Turkey by AKP, headed by Recep Tayyip Erdoğan, provoked debate in both Western and Muslim countries, but few commentators have analyzed the impact of AKP's third triumph at the polls on Germans of Turkish and Kurdish origin or heritage – the main Turkish immigrant community in the West, with as many as four million members, or five percent of Germany's total census. Turkish residents of Germany have the right to vote in Turkish elections. According to the leading organization representing the Sunni Muslim majority among them, the Türkische Gemeinde Deutschlands (Turkish Community of Germany or TGD), 63 percent of German Turks participating in the vote cast ballots for AKP and Erdoğan. Kenan Kolat, federal chair of TGD, told media that the pro-AKP result among German Turkish voters in the Turkish poll was a "legitimate representation of Turkish opinion." AKP gained support among German Turks because of the European economic crisis. The discontent of German Turks is considerable; this leads to a greater appeal for AKP. At the same time, rising prosperity in Turkey has produced an unusual trend according to which, since 2005, the number of Turks repatriating from Germany exceeds the number of Turks emigrating to Germany. But Erdoğan has been criticized because of the failure of Turkey under his leadership to gain accession to the European Union, as well as for AKP's Islamist ideology. TGD's Kolat emphasized that Erdoğan is committed to EU membership. Members of the Alevi Muslim minority – influenced by Shia, spiritual Sufi, and pre-Islamic shamanic traditions – and other moderate Turks and Kurds living in Germany are afraid of AKP, which seeks to recruit Turkish community leaders abroad. In 2010, AKP invited German Turks active in political life to visit Turkey. Its message to 1,500 people who accepted the offer was clear: Turks living outside their native country should accept citizenship in their new place of residence, and become politically active, but should refuse cultural integration, according to prime minister Erdoğan, speaking at a banquet for the participants. The AKP leader went on to condemn dual citizenship as an offense against human rights. The AKP government's vision of German Turkish political representation was articulated in publicity for the tour and banquet by German Turkish leaders, which was supervised by current Turkish state minister for labor and social security Faruk Çelik, who referred to the Germans as "our honorable representatives" and to Erdoğan as "our prime minister." Çelik has also caused controversy by referring to Christians as "unbelievers." The involvement of Turkish-born political and religious representatives from Germany in this effort added to sharp criticism directed at AKP. Alevi community leader Ali Ertan Toprak, who participated in the visit and banquet, said "this was quite clearly a lobbying event for the Turkish authorities." He said he was startled at how openly the Turkish regime argued that German Turks should represent Turkish state interests. "Opponents of Turkish membership in the EU, from among the German Christian Democrats, would have found a lot of material for their arguments," according to Toprak. The parliamentary representative and international relations spokesperson for the Left party (Die Linke – mainly ex-Communists) in the German Bundestag, Sevim Dağdelen, referred to a "hidden foreign policy" pursued by Ankara. "I would not want any part of it," she said. "I consider it unfortunate and doubtful that any German politician would participate in it." The election and the well-publicized tour were just two items demonstrating expanded AKP activity among German Turks. Another is the functioning of the Turkish-Islamic Union for Religious Affairs (Diyanet İşleri Türk İslam Birliği or DiTiB), the extraterritorial Turkish Sunni authority in Germany. Operating from Köln-Ehrenfeld, DiTiB is an umbrella organization for religious, social, and cultural activities based in the Turkish mosques in Germany. DiTiB is managed, controlled, and supervised by Diyanet, the State Islamic Administration of the Republic of Turkey, based in Ankara, and, indirectly, by the office of the Turkish prime minister. 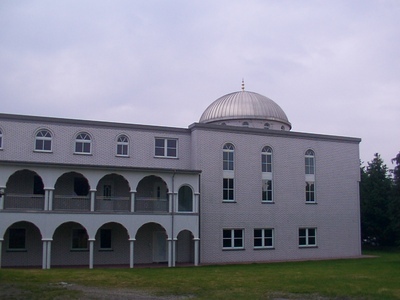 DiTiB Mosque in Brackwede, Nordrhein-Westfalen, Germany, 2005 -- Photograph via Wikipedia Commons. DiTiB claims to be the largest member organization for immigrants in Germany, and was a founding participant in the establishment of the Coordination Council of Muslims in Germany (Koordinationsrat der Muslime or KRM) in 2007. In the past, DiTiB was viewed as neutral; concerned only with religious activities. But DiTiB has come under criticism among German Turks. Lale Akgün, a leader of the Social Democratic Party, has warned that "AKP tries to use DiTiB to influence Turkish Germans." As evidence Akgün pointed to guidance issued by Diyanet in Turkey for "good and exemplary Muslim women." The text, which has since been removed from the internet, included recommendations against women travelling alone, among other restrictions on women's rights. There is a danger that "Diyanet will use its moral influence on people in Turkey as well as through DiTiB in Germany, to attempt to wipe out modern norms and customs that for a long time now have prevailed in daily life in Turkey," according to Akgün. DiTiB has been consistently criticised by Armenian groups and Alevis. Many civil disputes have been recorded because of DiTiB attempts to co-opt the Alevis. Meanwhile, the Turkish community in Germany also features an extreme right-wing nationalist movement, the Grey Wolves (Bozkurtlar). Discussion of radical right politics in the country typically focuses on anti-immigrant sentiment and ignores hateful ideology present within the immigrant communities. The Grey Wolves dream of a vast, revived Turkish empire, and have been present for decades in Germany, originally in the former West Germany. İn 2008 the Constitutional Protection Agency in the state of Nordrhein-Westfalen estimated the number of members of the Grey Wolves in Germany at 7,000. But this total does not include the movement's many sympathizers. The Grey Wolves base their ideology on the doctrine of "Turanism," which seeks to establish Turkish rule from the Balkans through Anatolia, the Caucasus, and Central Asia to Chinese-occupied Turkestan (Xinjiang). Ottoman-era Turanians believed in a mythical empire of Turan as the cradle of the Turkish race. Under the secular government established after the first world war, Turkey adopted a posture of neutrality in foreign policy, and the Turanian fantasy diminished. The founders of the Grey Wolves belonged to the radical-right Nationalist Action Party (Milliyetçi Hareket Partisi or MHP) created by army colonel Alparslan Turkes and modelled, with a paramilitary structure, on the German Nazi Storm Troops. The enemies of the MHP include such ethnic minorities as Kurds, Armenians, and Greeks, as well as religious minorities including the Alevis, Jews, and Christians, plus the Freemasons. The last movement is a frequent target of Turkish conspiratorialism because of its historical involvement in the dissolution of the Ottoman state. The Grey Wolves see themselves as "idealist" Turks under surveillance in Europe. The Nordrhein-Westfalen authorities accuse the organisation of "contributing to the establishment of a parallel society in Europe" and labels it "an obstacle to integration of the Turkish-born population." In June 2009, Ali H. Yildiz, a Köln-based board member of the German Turkish Forum (Deutsch-Türkischen Forum or DTF), a branch of the Christian Democratic Union, left office in protest against the failure of DTF to more clearly dissociate itself from the Grey Wolves. The problem has already reached a point where Turkish nationalist rhetoric in German schools gains a widening number of followers, establishing a climate of fear among students. The German media focus on Islamic extremists and neglect the menace of the Grey Wolves, but they represent equal problems and neither should be ignored.